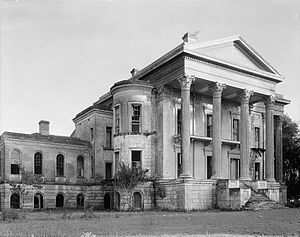 Belle Grove, also known as Belle Grove Plantation, was a plantation and elaborate Greek Revival and Italianate-style plantation mansion near White Castle in Iberville Parish, Louisiana. Completed in 1857, it was one of the largest mansions ever built in the South, surpassing that of the neighboring Nottoway. Nottoway is often cited as the largest antebellum plantation house remaining in the South. The masonry structure stood 62 feet (19 m) high and measured 122 feet (37 m) wide by 119 feet (36 m) deep, with seventy-five rooms (including a jail cell) spread over four floors.